Welcome, and thank you for visiting our website. I am the Gyoseishoshi lawyer of Fukasawa Gyoseishoshi Lawyer Office in Shinagawa-ku, Tokyo, Japan. Our office provides a variety of expat services including VISA application, company setup and bookkeeping services for expats living in Japan and companies and business entities hiring expats. With my background living and working as an expat in UAE, we will be at your side and do our best to make your life in Japan more enjoyable and more comfortable. Please do not hesitant to contact us. Mai was Born in Tokyo, Japan in 1985. After graduation from Chuo University Tokyo, she worked as a legal advisor at a global financial company and then as a sales representative at a Japanese trading company exporting construction machinery to Iraq and Libya. In 2013, she moved to UAE and experienced market research and corporate legal compliance at Dubai based company. After coming back to Japan, she participated UAE-Japan Education Partnership project supported by Abu Dhabi Education Council (ADEC) and Ministry of Economy, Trade and Industry, Japan. Until 2016, she has welcomed and took care of 100+ guests from Iraq, Libya, Jordan, Egypt, and UAE. After she passed the examination for Gyoseishoshi Lawyer during her maternity leave, she run her office in April 2017 in order to help foreigners in Japan with Visa application, company registration and business operations. Why did you decided to help foreigners in Japan? Holding a Japanese national passport allows me to travel almost all counties and I had never felt frustrated nor nervous about getting Visa until I decided to work in UAE. I was expected to move to UAE on July 1st 2013 and prepared Visa documents since May. However, my Visa could not be approved until the scheduled day and no one knew whether my Visa would be approved or not. As I had already quitted my job and terminated my apartment lease, I was very worried where and how to live in Japan without a job and until when I had to wait. Fortunately, I was able to move to UAE after few weeks later than scheduled, but this was not the end of my frustration. The biggest problem in UAE was my lack in understanding English, especially Hindi-English and Pakistani-English. For the first 3 months, I was not able to communicate with others at all and became very frustrated and depressed. My friends and colleagues are very supportive in my situation and they gave me many tips on how to communicate in UAE. After a few months, I got used to their English and learned how to interrupt conversation with a talkative speaker and to express my opinions with a simple, easy word without thinking grammatical rules. Every time I faced with problems in UAE, there are people who helped me out and these experiences changed my life. 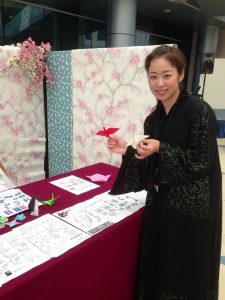 I started to do my volunteer work as a Japanese language teacher and hold Japanese cultural events in UAE. After coming back to Japan, my mission is to help foreign nationals in Japan. Unfortunately, many foreigners are struggling with language and cultural barriers in Japan due to our lack in English communication skill and few experience with foreigners. Let me listen your thoughts and dreams in Japan, and work together to get rid of the language and cultural barriers and enhance your life in Japan. From JR Shinagawa station, 2 stations, 5 minutes-ride on JR Yamanote line bound for Shibuya. Time required from Shinagawa station to our office is approximately 10 minutes. Taxi would be the easiest way to get to our office. Time required from Tokyo Immigration Bureau to our office : Approximately 20 minutes. Price: Approximately 2,000 yen. No parking available. If you are arriving by car, please use a nearby parking lot.